I write this piece on January 19, 2017: the last full day President Barack Obama is in office. It’s a somber day. First because it was a day I always knew was coming, and now that it’s here: I find myself sad. Second because the incoming administration does not make me feel good about this country’s future. It’s still hard for me to criticize Trump, and not feel as if I’m part of a liberal echo chamber. But the plain truth is: I don’t like Donald Trump because he seems to be an arrogant, incompetent man who is in no way prepared for the presidency. That’s just how I feel. I could be wrong. I hope I’m wrong. But I seriously doubt I’m wrong as I write these words. That all said: I want to shift back towards President Obama, a man I’m proud to call “my President”. I want to write about why he makes me proud. So much has changed in our cultural and political landscape since 2008. LGBT Americans now have a voice that cannot be silenced. Feminism has become a broader, more nuanced ideology that many men are trying to better understand. The institutional injustice towards African-Americans now cries out on our Facebook feeds. The alienation of the working class has come to a head. Of course, as I write this, I realize all of this may only be apparent to me — since I “live in a bubble”. Plenty of talking heads would argue “all this outrage” is Obama’s fault. That if he simply hadn’t rocked the boat with affordable health care, or made everything about bathrooms, or stopped trying to take our guns away, or hadn’t forced us to think deeper about a black girl getting body slammed by a cop — then this country would be in much better shape. I don’t listen to the talking heads, or cite them as the purveyors of fact. To be explicit: I’m referring to the ilk of Tomi Lahren, Sean Hannity, Bill O’Reilly, Tucker Carlson, Glenn Beck. To me: they’re irresponsible entertainers who are looking to make a quick buck over reporting the news — and they should be ignored. It takes courage to stand up and fight in this country; real courage, meaning that real sacrifice comes with it. I personally feel that the multiple incidents that sparked “all this outrage” was going to happen. If you step back and consider the full context — all of it, as in the years and decades leading up to it — events like Ferguson, Syria, Marriage Equality were going to happen on someone’s watch. In full fairness: I don’t know how a President McCain would have handled it; I think a President Romney would’ve tried for empathy but would’ve fallen short. As we know from the examples of Reagan and Bush II — looking away to only the positive is relatively easy for a President. President Obama, however, shined a light on all of it — through both policy and oration. 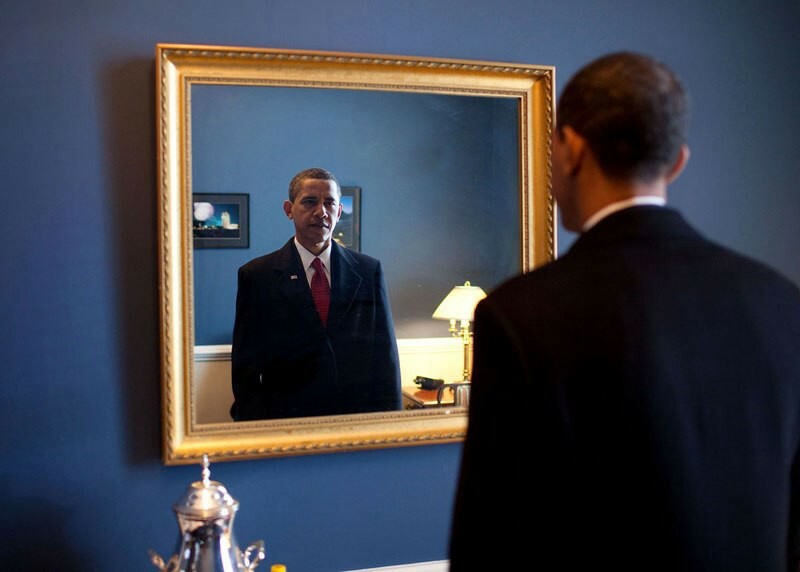 The first African-American President in our history forced us to check our own privilege. And many, as a result, were uncomfortable with what they discovered. It’s no secret how African-Americans ended up in this country. As Ta-Nehisi Coates skillfully wrote in Between The World And Me, our country has benefitted from the black body as a commodity. Slaves were considered raw goods; their labor supported our economy through The Civil War without any compensation or real benefit relative to white Americans. And even after The Civil War ended and we stumbled out of the unease of Reconstruction, state and federal government still used laws that kept black people in poverty and without higher education, forcing them to take whatever menial job they could find. And — ironically — they were told through out the 20th Century: if you try really hard to be one of us (i.e. White and mainstream), maybe we’ll give you a seat at the table. And plenty tried, incredibly hard, and had to settle for what they were given. When activists spoke up — whether it was Martin Luther King or Malcolm X — they were literally silenced. And yet: 143 years after the end of The Civil War, our country elected a black man President of The United States. And 147 years after, we re-elected him to that office. When he leaves tomorrow, almost 152 years will have passed since we ended the slave trade in this country. There are many who regard that fact as progress in a vacuum, and don’t see any connection when criticizing the President for stirring this country’s pot. But, in truth: to ignore it is to do this country a disservice. Our President had a choice when he took office. He was well aware of the symbolism of his administration, but he could have chosen to stay quiet about social unrest or income inequality. And yet: he didn’t. It took 152 years and our first black President to truly make us aware of whom we may be as a country. Much like a human being, we are not perfect, we have bias, and we believe what we believe because of the source. And yet: he spoke of Hope, of Change; that the old table was getting replaced with something bigger that would have plenty of empty seats. Much like his modern predecessors, he still believed in the potential of this country. But he also represented a conversation we have long-delayed having; and he chose to engage in that conversation at the highest level — knowing that the worst may happen. As I watched the President’s Farewell Speech last week, many of these thoughts popped into my head. And I realized that if this country can finally elect a black man President — twice, and not kill him — then the United States is, indeed, a great country with many great years still ahead. There is, of course, still work to do and there is valid criticism against Obama. Tomorrow, a candidate will be inaugurated who seems a rebuttal to the last 8 years. In that same speech last week, our President spoke of rolling up our sleeves and being the change we sought. As fundamentally disappointed as I was in the election results, it seems to me to have yielded another irony. I think of it as “the irony of privilege”. If we believe so deeply in the progress we’ve made, then we must fight for it. We cannot assume that “everything will be fine” because real threats to basic freedoms and fairness live in the form of Paul Ryan, Mitch McConnell, and Donald Trump. So to be complacent or cynical hurts us. And yet, we must also be heartened by the social change of the last 8 years, and 152 years, and look to it as a sign that we will get through to a better future. But as the President said: it starts with us. It starts with looking at who we are and asking if we are who we want to be. And in the face of such immeasurable ignorance, are we okay with letting ourselves stay exactly the same? I, for one, am rolling up my sleeves. Thank you, President Obama. You made me proud of this country and proud to be an American.